The Tour de France trophy won by Geraint Thomas this summer has been stolen from a display at the NEC in Birmingham, Team Sky have confirmed. The Coupe Omnisports, presented to the winner of the race on the Champs-Elysees since the 1970s, was one of three Grand Tour prizes being displayed around the UK and was loaned to Italian bicycle manufacturer Pinarello for The Cycle Show at the venue. Police are investigating the theft, which Team Sky say occurred when the trophy was "momentarily left unattended" during the clear-up operation that followed the three-day event. Geraint Thomas, who lifted the trophy for Team Sky in July, said: “It is incredibly unfortunate that this has happened. It goes without saying that the trophy is of pretty limited value to whoever took it, but means a lot to me and to the Team. Hopefully whoever took it will have the good grace to return it. Thomas claimed his first Tour de France general classification victory in July by a convincing margin of one minute and 51 seconds from Dutch rider Tom Dumoulin, with teammate Chris Froome - who had lifted the trophy in four of the previous five years - finishing third. 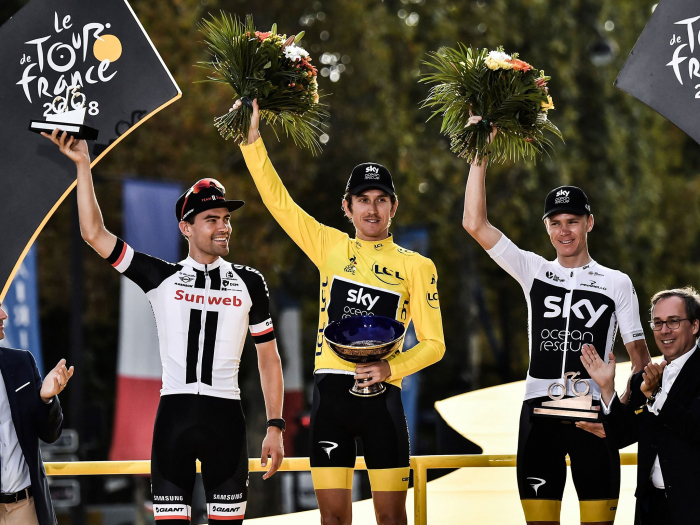 The triumph made Thomas the third Team Sky rider to win the Tour de France after Froome and Sir Bradley Wiggins, as well as ensuring that a Brit has won seven of the last eight editions of the race.